Zach Doherty, aka The Bold Doherty. That Irish Guy, aka Ireland native Emmet McElhinney. Aubrey and Dan Tobin own Crown Alley Irish Pub in Ocean Park. For bands and audiences alike, an Irish pub is the ideal place to relax, eat, drink and share stories with friends. This is also what Crown Alley Irish Pub owner Dan Tobin in Ocean Park, Wash., wants to bring to listeners at the first annual Coastal Celtic Music Festival, taking place Friday through Sunday, March 22 through 24, and featuring 10 bands from Washington and Oregon: Annie Henry, Katie Jane Band, That Irish Guy, The Bold Doherty, Sons of Malarkey, Stout Pounders, Castletown, Curlew’s Call, Marian DiCicco and the Shameless Celts, from Long Beach, Wash.
Tobin, who opened the pub last June, hosts live music every Friday and Saturday night. The festival musicians, he said, are upbeat “pub rock” bands that often interact with the crowd. The festival starts at 5 p.m. Friday and ends at 9 p.m. Sunday. Tickets are $30 Friday, $60 Saturday, $50 Sunday, or $100 for all three days. The bands will also play at the Chautauqua Lodge, Peninsula Arts Center and Shelburne Hotel. Tobin likes the storytelling element of Celtic and folk music. “I feel like there’s something about music that can really touch anybody, and it doesn’t matter if you’re from the same walk of life or even speak the same language, you can enjoy music with somebody,” Tobin said. He wants festivalgoers to relax and enjoy the music, food and drinks with their friends. For That Irish Guy, aka Ireland native Emmet McElhinney, music is in his DNA. His great-grandmother was Sarah Makem, a collector of folk songs from Ireland. Her son was Tommy Makem of the famed folk band The Clancy Brothers, who played for Bob Dylan at the White Horse Tavern in New York City’s Greenwich Village. McElhinney will play a variety of old and new folk songs from America, Scotland and Ireland. “One moment I’ll have you laughing and the next moment you’ll be crying with tears for the old country,” he said. McElhinney enjoys performing folk music because it’s a “music of the people.” “It’s a music about the people. It’s about their lives, their stories,” he said. He said Irish music isn’t celebrated in Ireland as much as it is in the U.S. Surprisingly, Irish people want to hear more American country music. But he says there’s something special about the atmosphere of an Irish pub. “It’s just a community hub — that’s what I like about an Irish pub,” he said. Josh Curll, a vocalist and guitarist from the band the Sons of Malarkey, said he feels like the band is “brothers and sisters in arms” after playing together for 10 years. “We just have a feel for each other,” he said. 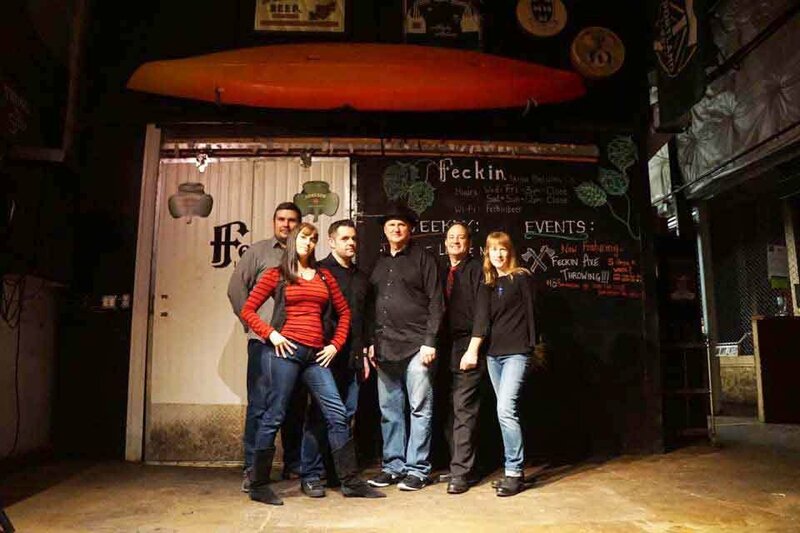 The six-person band plays Irish rock and is inspired by bands like The Clancy Brothers and The Dubliners. He said the band is looking forward to playing at the first year of the festival and is excited about its potential. Stout Pounders are one of the festival’s other large bands. Darin Wallace, a vocalist in the five-person group, said they are “untraditionally traditional.” They play traditional Irish and Scottish Folk music as well as covers and original songs. Stout Pounders have been the house band for Seattle’s St. Patrick’s Day Dash for the last 10 years. For festivals the band tries to create sets that have good starts that carry through the middle and finish strong. “We don’t care if we’re playing for 20 people, 200 people or 2,000 people, we bring that same energy,” he said.